When I think of the Deep State swamp rats who grew fat dumb and happy during the time of the Obama administration, I can’t help but think of Mafiosos. And in the Chinese Year of the Rat, all these rats will be exposed. 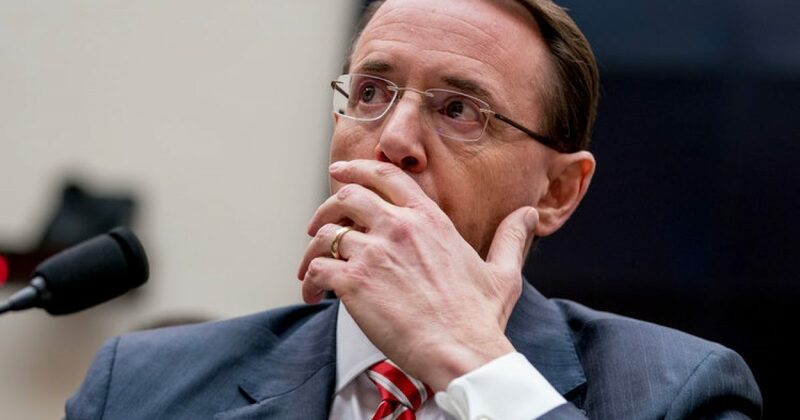 Based on an interview by disgraced FBI Deputy Director, we learned that Rosenstein indeed participated in the attempted coup of President Trump. And now it appears that Rosenstein has decided to hasten his departure from the Trump administration. Rosenstein, who has been overseeing special counsel Robert Mueller’s investigation, said in January that he would leave shortly after the arrival of a new attorney general but that he would stay long enough to ensure an orderly transition. McCabe said in an interview on “60 Minutes” on Sunday that Rosenstein considered wearing a wire in meetings with the president. Yes. I’m sure the revelations by McCabe have nothing to do with his decision. If you believe that, then you likely believe that two pro-Trump MAGA-hat-wearing rednecks attacked Jussie Smollett on Jan 29 in the most black gay area of Chicago. Rosenstein is part of the DC crime syndicate that added the Obamas to their list. The Clintons, the Obamas, the Schumers, the Pelosis, and the political establishment are the five families. On multiple occasions we connected the dots on how things work. The only thing that got accomplished in Washington, pre-Trump, was the continual theft of the American people. When Donald Trump stopped the money flow, the coup continued. Rosenstein, et al believed Trump wouldn’t be elected. So things would continue, business as usual once Hillary Clinton became president. That’s why the Clintons didn’t shut down their crooked organization. Also, McCabe had cleared the runway, protecting the Clintons from FBI scrutiny. McCabe killed any hint of impropriety with TCF, knowing how dirty the organization operated. The cast of characters all ran interference in one form or another. It’s truly fascination (and horrifying) how much power was wielded by such a small few. Since the McCabe interview on 60 Minutes, I’ve been on Mueller Watch? What will this Deep State swamp rat do in light of recent allegations? Popcorn and pop in hand, I plan to enjoy this comedy. Mueller won’t be able to pull a “Comey” and lead us to the brink of indictment, then give people a pass. Certainly Mueller’s back is against the wall. He delayed releasing this report for the same reason Jussie Smollett delays meeting with Chicago PD. Doing so will only bring more misery to both men. Regardless of when Rosenstein officially leaves, he will return. He has no choice. Although the House has new leadership, the Senate remains in control on their end. And either Rosenstein or McCabe is lying about attempting to set up President Trump. America is better off with Rosenstein gone, that’s for sure.